Interested In Serving on the 2019-20 League Board of Directors? The League's Federal Priorities, copies of letters and sample letters, and additional federal legislative information are accessible below. The League’s 16 Regional Divisions cover every corner of California and serve as the grassroots advocacy core of the League. City Officials, both elected and professional city staff, work closely with the League regional public affairs managers to develop regional informational programs and carry out grassroots activities to support specific legislative, regulatory and ballot measure goals. Divisions provide necessary input and counsel from a diverse range of perspectives among a membership from all over the state. Divisions also participate in policy development by appointing representatives to the League’s board of directors, resolutions and policy committees. Division appointments are also made to the League annual conference program committee. For more information on how to get involved, including regional events and staff contact information please click on your regional division below. 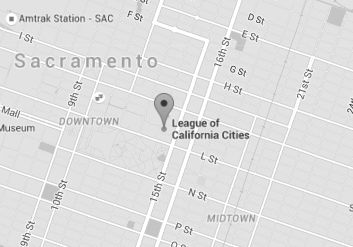 If you would like to receive general information about the League’s Divisions, please call (916) 658-8200 or contact your local regional public affairs manager. A majority of policy committee members must be elected officials. Each department may appoint one representative to each policy committee. Each division may appoint two representatives to each policy committee. League affiliates may appoint one representative to appropriate policy committees. The League president may appoint 16 additional members to provide added expertise as well as geographic and population balance. Find out how to join a League Policy Committee. Functioning as professional societies with educational and networking opportunities, the League's 11 municipal departments play an essential role in forming League policy and programs. Each department is represented on the League board of directors, as well as on each of the League's eight policy committees. Supporting high-quality service to cities and their citizens by assisting the League with continuing education programs, newsletters, and other works of interest to department members. The League is committed to promoting involvement for all city officials, in order to reflect the diversity of California's cities. Toward that end, the League has recognized five diversity groups, whose purpose is to present yet one more opportunity for city officials who share common interests or characteristics to connect with one another. Membership in these organization is open to any member of the League, as is participation in any of the caucus meetings or sponsored events. Get League of California Cities news and information delivered directly to you by subscribing to RSS feeds or through the CA Cities Advocate email newsletter. Really Simple Syndication (RSS) is a format for delivering regularly changing web content to you. The RSS feeds provide headlines and descriptions of content, along with links to the full articles. RSS feeds typically are linked or indicated by an orange rectangle with the letters RSS. Sometimes the presence of RSS feeds is indicated by an orange rectangle with the letters XML, or by the symbol RSS icon . How do I subscribe to a feed? In order to subscribe to an RSS feed, you will need a news reader. Use your favorite search engine to find a "news reader." Many are available for free, and some newer browsers have news readers built right in. These readers allow you to subscribe to news feeds and will check the feeds for you automatically and update you with the latest headlines. It is easy to subscribe. When you see the RSS icon on our site, just select the icon, and you will open a new page. Simply copy the address of the feed to your news reader. Once you subscribe to a feed, headlines are available in your reader. When you see a headline that interests you, just select the link to view the full article.